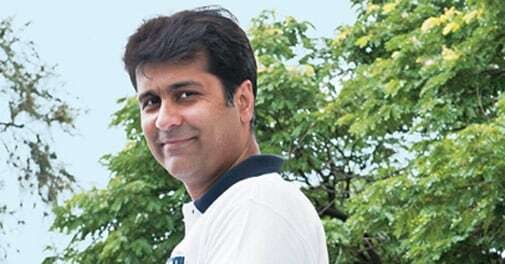 Rajiv Bajaj dived into homeopathy and yoga to weld a modern marketing strategy. The results are therapeutic. There are many endearing management books, but there are no enduring ones. Immersed in that belief, Rajiv Bajaj decided to script his own. Not a physical book, but a set of ideas that are as intangible as some of the principles they emanate from. It took years of striving, seeking, and finding. Curiously, strategy was the last ingredient to be added to the recipe. The first was homeopathy. Sometime in 2002, Bajaj noticed that his son, four years old then, would fall ill every two or three months. So would the son's friends. That set Bajaj thinking. "Our childhood was not so long ago. But I do not remember us falling ill so frequently." Some of it could, of course, be ascribed to pollution, junk food, the changed lifestyle, and the accompanying stress. But what was the solution? The usual prescription of paracetamol, antihistamine, antiobiotics and, in acute cases, cortisone could not be sustained for long. As is his usual approach, when Bajaj thought of homeopathy as the possible solution he dived deep into it, right down to the Organon of medicine written in 1810 by the father of homeopathy, German physician Samuel Hahnemann. He approached the subject devoid of the scepticism that can at times afflict practitioners, and understood more than he read. "Rajiv tends to relate everything to homeopathy these days, so much so that his son says he suffers from 'homeopathy ke side effects'. Sometimes he overdoes it. His dogs are on homeopathy. I treat them," says Sunil Anand, Bajaj's doctor, who is based in Pune, the same city as Bajaj and his company, motorcycle and threewheeler maker Bajaj Auto. Today, everyone in Bajaj's immediate family, extended family, friends and colleagues is on homeopathy. So is his company, albeit with a twist. It is said of homeopathy that it does not benefit those who do not have faith in it. But with Bajaj the benefits came first, then the faith. And the faith, once entrenched, segued into management philosophy. Here is how. All branches of medicine have the concepts of wellness and the immune system. Cough or cancer, if pushed hard all doctors will tell you the cause is that your immune system has gone awry. Only, a homeopath approaches it differently. If cold weather gives you the flu, prawns allergy, or playing squash aches and pains, it does not mean that cold, prawns and squash are bad. They cause no harm to scores of other people. They are exogenous, exciting causes that disturb your wellness because of endogenous factors that are specific to you. "That is true of businesses as well. The information technology industry has rumblings, but TCS (Tata Consultancy Services) shines bright. Sun Pharmaceuticals goes from strength to strength, but not the others in that industry. IndiGo can do no wrong, but that cannot be said of many others in aviation," says Bajaj. That can be put down to the individual constitution of the companies. The homeopath deals not with symptoms but with the endogenous cause so that you are no longer susceptible to exciting factors from the outside. The manager's job, in the same way, is to work from the inside to clarify, correct or strengthen the strategy to remove any susceptibility in the organisation. "As a manager, my job is to work not on the system but in the system. Within the same system and environment why should I not be more like TCS, Sun and IndiGo? I must be less concerned with the exciting causes that lie outside of me and be more aware of the fundamental causes that lie inside me. The homeopathic equivalent of individualisation in the corporate world is specialisation. Every company should be specialised in certain important aspects. In homeopathic terms, every individual has a constitution; the analogy in the corporate world is a business model," says Bajaj. Listening to Bajaj-the voice coming out of his mouth but so rich in timbre it seems to originate from some place deeper - the application of homeopathy in corporate strategy sounds deceptively simple. But, of course, it isn't. And therefore Bajaj has no hesitation in giving it out. A person's immune system is intangible. It cannot be captured on X-ray, MRI, or ultrasound. Nor can it be operated on. The same is true of a company's strategy. Unlike its material assets like land, manpower, capital, and machinery, its strategy is impalpable. "I can show you all the material aspects of Bajaj Auto, but if you say please show me your strategy, I cannot," says Bajaj. There is safety in that, just as there is in his adoption of Jack Trout's ideas. But we will come to that later. For now, there is yoga. 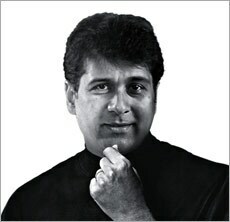 It is not an exact analogy, but Rajiv [Bajaj] is kind of Steve Jobs of the motorcycle world. Jobs was very rare; he was the best marketing CEO in the technology world. He had a sense of marketing and design. He knew what he wanted and pushed his people to come up with it. Rajiv got a new engine technology. He got out of scooters, a decision which did not make his father very happy. Of all the moves he made, [pulling out of scooters] was the boldest. His father's reputation was built on scooters, and on that thing I can never pronounce [Hamara Bajaj]. That's what separates him from several other CEOs. We have had long discussions on it. How many battles can you fi ght? And how many battles do you have the resources to fi ght? You have to concentrate your forces if you are going to win battles. Rajiv and I have disagreements, but it is fun discussing things with him. I have told him that he has to reposition the Bajaj brand. His family uses the Bajaj name for a lot of other stuff. It is not good, especially in the very competitive world in which we live. You have to have some priority about your brand. I have had arguments with his father about that. I have told him that if I were him I would rebrand all the other businesses. Jack Trout, the marketing strategy guru, has worked with Rajiv Bajaj and his team for nearly three years. The concept of yoga comes from the word yog, which comes from union - union of the body with the mind, and of the mind with the Creator. In another word, it means alignment. What you think and what you do should be aligned to a superior goal. In the corporate world, as companies grow bigger, the larger goal - the mission, the vision - becomes hazy. And, as would happen in the case of all things hazy, aligning your organisation to the goal becomes difficult. But some manage to keep it sharp. "IndiGo has a clear goal: an airline that is hassle-free, on-time and lowcost. The goal is clear. Everything [CEO] Aditya Ghosh does is aligned to that," says Bajaj. "When we said to ourselves we will be a motorcycle specialist, it served to align everyone to that goal. The purpose of the organisation is clear." That is easier said than done, given that corporate history is full of the debris of diversification. To avoid joining the heap, Bajaj looks at yoga for solutions. Before Baba Ramdev planted images of kapal bhati in the minds of Indian television viewers, yoga was mostly about the aasanas. The aasanas, while putting the body in a certain position, focus on the breath. In homeopathy the remedy works on the nervous system and the nerves carry the sensation of the remedy through the veins, correcting the physical body. Yoga acts on the breath, whose power influences the nerves as the body gets stretched in a way that stretches the nerves in a certain way. That carries sensations to the brain, which releases certain chemicals in a way that heals. Therefore, the first thing you need to do in yoga is to choose the aasana you want to perform. That is, take a position. The second is to find your centre in that position, so that you are perfectly balanced and the aasana feels effortless. That achieved, you can stretch, or twist, or bend or do whatever else you want in that position. The critical thing is to find your centre. "We can translate this in business terms as first a company or brand must take a position in the market. What do you stand for? Secondly, you have to find your centre in that position; doing business in that position should become less and less stressful. You should not be sweating, you should not need a prop. If you do, you are not aligned. Once you find the centre- once your morale is high, your sales are good, your margins are good, your attrition is low, and you come to work happy-you can expand," says Bajaj. Clarity of goal, therefore, is not to snuff out expansion-after all, growth in business is all about product and market expansion- it is about growing after you have taken a clear position and found your centre. That's nicely put, but is anything of this startlingly new? Bajaj handles the question adroitly. "Even if you say there is nothing new about this, at least homeopathy and yoga have given me a different language, a different set of words with which to talk to people so that their mind opens up to something new. Otherwise, we are spewing the same buzzwords all the time and nothing changes." Bajaj does not have much patience for the usual buzzwords of corporate strategy. And for good reason. Studies say 90 per cent of all new products and services in the United States and Europe failed in a certain period. "What can explain this? Would you fly an airline that crashes 90 per cent of the time? Go to a surgeon 90 per cent of whose patients die? Send your child to a school with 90 per cent failure rate? What gives managements the right to be wrong 90 per cent of the time?" Bajaj asks, referring to the questions raised in a book by marketing strategy consultants Al Ries and Jack Trout. According to him, the problem lies in the fickle nature of management thought. "Every six months they invent a new theory," he says, raising a sardonic eyebrow while mentioning principles like world-class manufacturing, core competence, bottom of the pyramid, just in time, total quality management, CAD-CAM, Lean, Six Sigma, Seven Habits of Effective People, Seven New Habits of Effective People, and the Blue Ocean strategy. "The Bible is the Bible forever. If you Google Newton's laws, they are the same. The Bhagwad Gita never changes. A book on medicine evolves, it changes a little bit. Chemistry, biology, physics, and religion evolve. Management does not evolve. Suddenly one business school decides, 'This time to get all students in for $100,000 a year I must sell them something called Restructuring the Corporation, the new thing to do'. By the time the poor critters are passing out some new theory has come. They realise they have wasted their two years and learned nothing. And authors of business books keep writing on these topics." The trouble is, all things do not fit into one puzzle. A management person cannot look at the puzzle and choose his toolkit. "This kind of flawed education leads to the theory that you just have to do something better, that if you do something better you will have better business. There is no talk about specialisation, sacrifice, differentiation, or firstmover advantage. There is none of that. They do it because they are also running a business, they need to get students into seminars and sell their books. Mr Ries says the vast majority fails because they were introduced to serve a market rather than to create a market. The job has to be always to create a market." 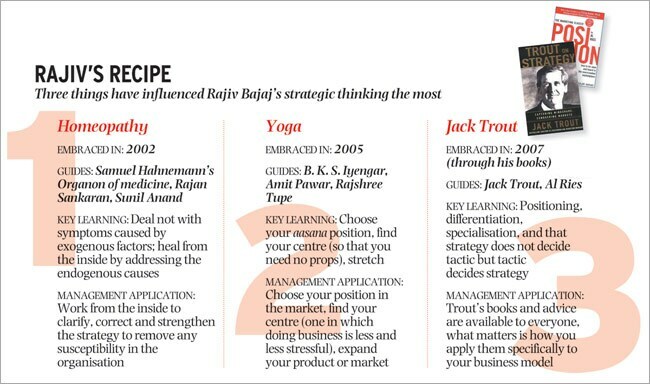 From Ries and Trout's books, and by interacting with Trout, Bajaj gleaned lessons in positioning, differentiation, and specialisation, as well as counterintuitive concepts like 'strategy does not decide tactic but tactic decides strategy'. He quotes them freely. Trout says, half in jest, that at times he wonders if he did really say that. Just as in the case of homeopathy and yoga, Bajaj's gleanings from Ries and Trout are not kept in Fort Knox. And that is where the homeopathic principle of individualisation comes into play. "Mr Trout's books are available to my competitors. They can also hire him. Somebody else will get invaluable advice but not necessarily the same answers we got. They may get superior answers, but different answers. You have his gyan, but how do you apply it specifically to your business model? That I understood from homeopathy." Talk about perfect alignment. Talk yoga.